Hagel called the reductions — including shrinking the Army to its smallest size since before World War II and eliminating an entire fleet of Air Force fighter planes — “difficult choices” that will change defense institutions for years to come, but designed to leave the military capable of fulfilling U.S. defense strategy and defending the homeland against strategic threats. Hagel admitted there are risks in his proposal. For example, the Defense Dept. report says Hagel’s plan “calls for reducing to as low as 440,000 active duty soldiers from the current size of 520,000, while ensuring the force remains well trained and equipped.” Any reduction in troops for a country that’s had so many stationed overseas for so long seems risky. There is optimism in the idea of making these cuts. They show strong confidence in our technological advantages and suggest reduced national posturing in favor of calm command of the situation. That said, I was looking through papers from this date 100 years ago when I found an article that made me question my positive response to Hagel’s press conference. Great Britain was the leading world super power in the early 20th century, though several nations nipped at its heels. 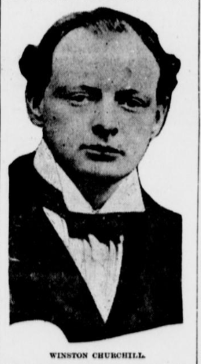 Winston Churchill, circa 1914. From a copy of the Ontario Argus, 2/26/1914. The First Lord of the Admiralty speaking of Europe’s clear “situation” and good relations between his country and Germany was Winston Churchill, then 40. Approximately 5 months after his address, World War I began. In 2014 perception of our world situation is clearer than it would have been for anyone taking the temperature of the times in 1914. Anyone curious and engaged with access to the internet can get a better grasp on the situation in Ukraine in 50 minutes than 1914 English military intelligence might have had on tensions in Austro-Hungary in 5 months. So it would be silly to use the irony of Churchill’s proposal coming a scant few months before the Great War to predict events in the world today. And the parallel is weak, if you poke at it–for example, America’s proposed draw-down of troop force is for the US alone. It’s budgetary, not pacific. Chuck Hagel didn’t invite China or Russia to do the same because the world situation seems just fine now; he knows it’s not. Archduke Franz Ferdinand was assassinated on June 28. The war began on July 28. Five months from now, everything will likely be fine and Hagel’s announcement won’t seem ironic. After all, in our hyper-connected world, how could things change that fast and a nation as powerful as the United States not have some warning? Well… each year, the Council on Foreign Relations (CFR) issues a “Preventive Priorities Survey.” Its purpose is to evaluate possible future violent conflicts around the world. The survey also determines how likely a given conflict might be in the year to come. Ukraine, which in the last week toppled its President after months of protest, was not highlighted at all. Now the Russian military is on alert as tensions rise between Russia and the new, still wobbly Ukrainian leadership over the Crimea. It isn’t that World War III may be right around the corner. That’s a stretch. But even today, Venezuela and Ukraine alone prove that international affairs can explode in remarkable, unpredictable ways. Those events can defeat the deeply informed minds in the United States Defense Department or the experienced analysts at the CFR and render their plans and warnings moot. Just as in the past, when a chain reaction of chaos blooming across Europe confounded–perhaps–a mind like Winston Churchill’s. I wonder if Churchill ever thought of that “naval holiday” proposal as the Great War raged, and shook his head in dismay. Somehow, I see the proposed draw-down as not only budgetary, but technological. It seems to me (from my only-slightly-informed perspective), that massive numbers of “boots on the ground” are as outdated as Wolfe and Montcalm lining up their soldiers on the Plains of Abraham. In these days of drone attacks and targeted SEAL forays, paying for weapons that are already obsolete makes no sense. The part that really bothers me is the lowering of benefits for soldiers and their families. Also, the returning veterans need health services that they are not getting.